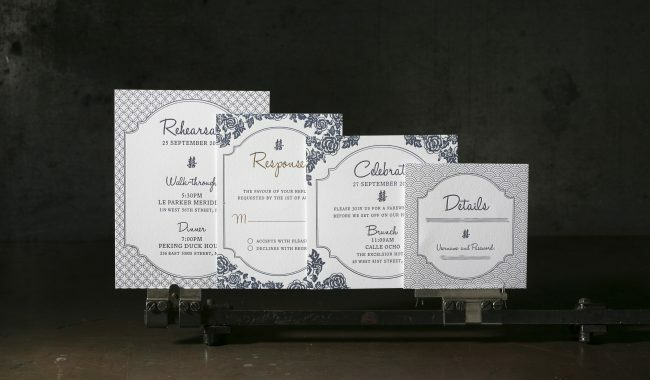 letterpress, foil stamping, and digital printing. Crane Lettra 220# and 110# cover on fluorescent white and Mohawk Superfine 100# in white. 1 letterpress ink (540) + gold matte foil. printed on our Heidelberg Windmill 10 x 15, our Kluge EHD 14 x 22, and our HP Indigo 5600. 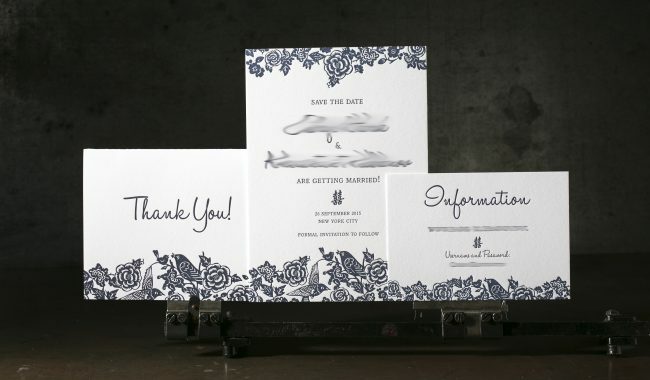 We worked with Cheryl to print an entire stationery suite for her client’s September wedding, starting with letterpress save the dates (5″ x 7″) and informational website cards (3.5″ x 5″). 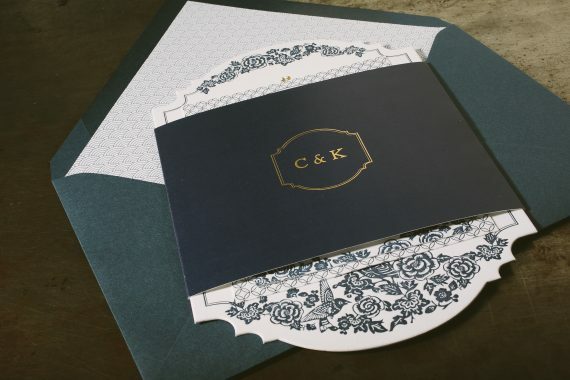 The elaborate die-cut wedding invitations (5.5″ x 8.5″) featured letterpress printing and foil stamping, and were accompanied by an assortment of insert cards that, when assembled, showed the varying intricate patterns used throughout the suite. 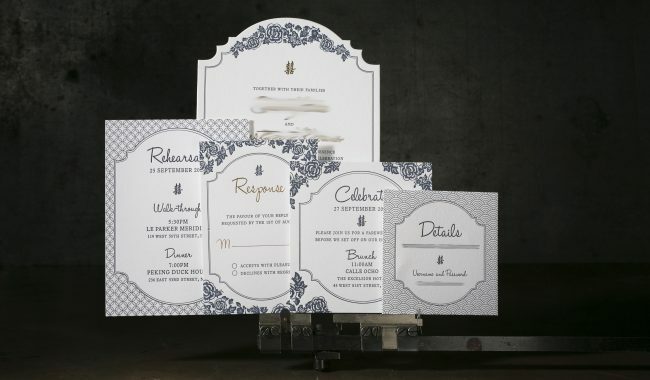 An ultra-wide, digitally printed bellyband (12″ x 4.625″) wrapped around the set, with a gold foil stamped monogram on the front of the band echoing the shape of the invitation. 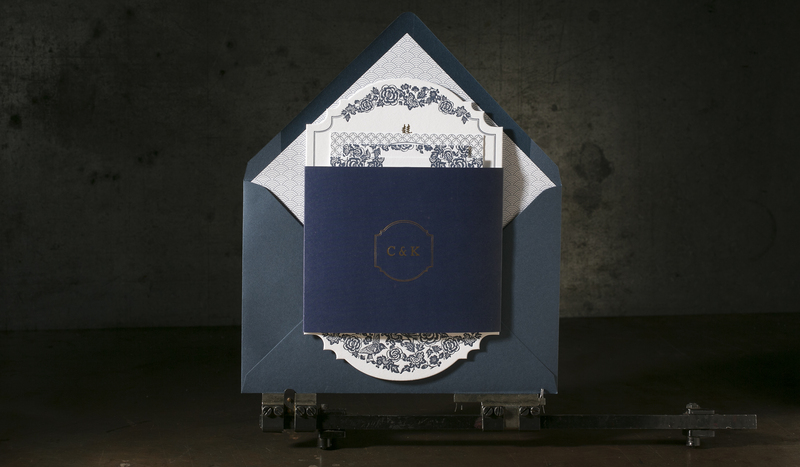 Cobalt blue ColorPlan envelopes were hand-lined with digitally printed envelope liners to match. 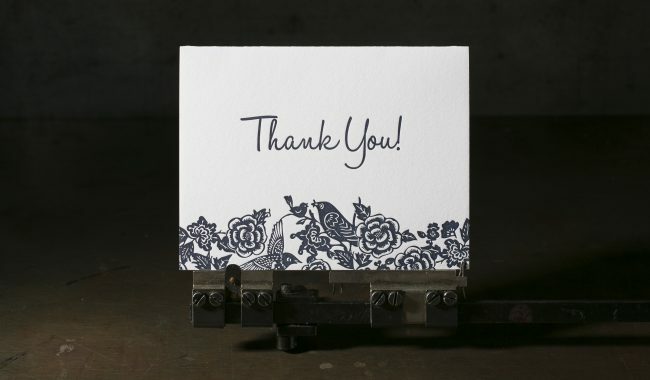 Folded letterpress thank you notes were also printed as a final coordinating piece.